This is a special section to help us celebrate, brag and share fun stories or to honor the memory of a little one who has left a lasting impression on our hearts. 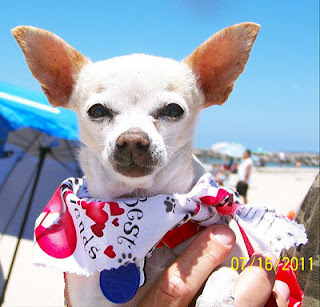 Make a donation of $25 to the Chihuahua Rescue of San Diego County and we will post a memorial, birthday, anniversary, accomplishment, new addition to the family or even just a happy story that you’d like to share with the world. Ten years ago, when I first met you, Rico, we adopted each other right away. It was kismet- an instant bond between two beings. The first second we met in the “greeting area” you peed on my leg, and in a dozen other places. Nevertheless I knew it was meant to be- you would become and remain my saucy lil’ friend for the next decade. I’m not sure I could have made it without you. Through your patience and love I made it through some really tough times of loss and anguish. You are always part of my family. Unconditionally. With prickling eyes, I state the obvious- I miss you. I see a sock on the floor and I still think that it’s you. My heart rises for a nano-second until my brain kicks in and reminds me that it wasn’t a nightmare- that you are really gone. The last moments we had together you wanted to be in my arms more than anywhere else. I’ve rarely felt so important in my life than when you showed me your love and trust. Rico, you were always special. So here we are, without you. Rita really misses you. I bet you can’t imagine her being quiet, but since you’ve been gone she barely makes a peep. She knows you loved her very much. She loved the way you cleaned her face and snuggled up next to her on the cold days. You might not have known how much I loved watching you relax in the sunshine. I loved the way you made a beeline to the warmest sunny patch on the deck, and then half close your eyes to seemingly gather more sunlight. It made me relax just seeing you chill out on the deck. I know that you will have a perfect patch of sunlight all your own now. Enjoy the warmth of the love you‘ve made, as I will enjoy the warmth you left in my heart- I know that love will expand when the sadness of my losing you subsides. Her name was Isabella and today would’ve been her 13th birthday. We adopted her when she was 3 months old. 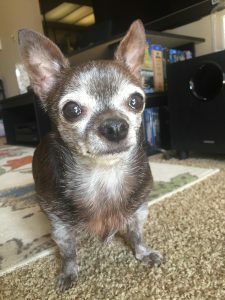 She was a special needs Chihuahua, she developed epilepsy when she was 6 and later was diagnosed with Cushings and Congestive Heart Failure. But she was such a bossy, happy little dog. She was so tough, she never acted like she was sick and she always kept us on our toes. We lost our little peanut back in November. We love her immensely, and we miss her and talk about her every day. I was 21 years old when we met- almost 22. I was lonely and living alone for the first time ever and full of anxiety for the final school year of my life that lay ahead. The best $200 check I ever wrote brought me the best friend I have ever had. She had worms, a patch of missing hair and was clearly smaller than her brother and sister, but her heart was large and her spirit, strong. I loved her from the first moment I saw her. She was remarkable. Puppies cry and mess and cry some more. Not Tapa. Tapa loved her new home right away and only “messed” on towels or rugs on top of the carpet- never the floor itself. She was wise from the start. She was picky about her toys, only ever really taking to hedgehog and camel. Camel was her favorite. I sewed that camel back together so many times it finally got to the point that the fabric was un-sew-able. Her hedgehog suffered the same fate. I used to hide treats inside of him, along with re-stuffing him with the cotton he came with that Tapa felt inclined to continuously remove. She would aggressively swipe each creature back and forth like she had cornered her prey and now was dealing the final blow. Funny for a sub-5 pound animal to have such confidence in her stuffed animal hunting skills. There was not a piece of food she would decline. Always a grateful eater, the puppy vacuum you could count on to keep the floors clean. She loved cheese and greenies, especially, and in her last days she finally was able to make all her dreams come true by eating real people chicken every day. It’s too bad her appetite wouldn’t allow her to indulge as she once would have, but I suppose that’s the rub. Without the illness, she would have been relegated to her own boring food. A lesson in life to make sure you thread a little indulgence throughout your days in a balanced fashion. What an honor it has been to have her in my life. She has truly made me a better, stronger person. I hope that I made her life as special as she made mine. It’s only fitting that one of the driving factors of her decline was that her heart had grown too large. She was always bigger in life than her size or breed suggested. As I knew then, and know again, now, there are just no words that give justice to this incredible life- I am limited by the English language in my ability to eloquently grieve. She saved me so many times, and in the end, protected me from my greatest fear of having to take her life myself. I love you Tapa. You are the greatest, smartest, cutest, funniest, most loving dog that ever lived. Thank you for loving everyone around me and most of all, for loving me, best. It was my honor and privilege to share my life with you for 15 years, almost to the day. I will miss you every day, for the rest of my life. I love you. 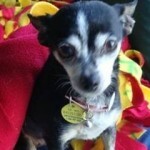 When I met 12 year-old Tilly at a local shelter, I heard the word “unsalvageable” used to describe her. Something in her eyes told me she didn’t feel the same way, and I brought her home. Tilly was shy and quiet, but barked in protest if anyone (visitors included), tried to leave the house. Although she loved a lap and taking walks, she enjoyed prepping her special blanket into the perfect “cave,” or finding her favorite spot on the grass to soak up the sunshine. For 3 years, she taught me that a senior pet can bring a special kind of joy and unconditional love into one’s heart and home. She was a very brave little girl who never once complained. Tilly, I will always love you and miss you, but we’ll meet again someday. Wear your wings proudly, fly over the Rainbow Bridge and run free. 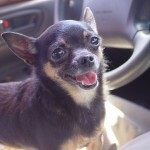 I felt excited and nervous the first time that I saw Mattie, the pre-selected Chihuahua that I volunteered to foster until she got adopted. 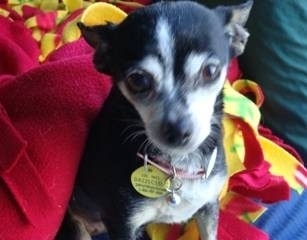 She was shy and reserved instead of the Chihuahua that I had imagined in my mind’s eye. This was another reason I didn’t think that Mattie was the “right” dog for me. But after a week, I knew that Mattie wasn’t going to be adopted by anyone else but me. Mattie and I became attached to each in a short period of time, as if we were thrown together by the rough seas in a small dinky with no one else on board. I knew we would be together for a long time and it was uncanny that Mattie seemed to know this truth too. I received so much joy from letting Mattie into my life. 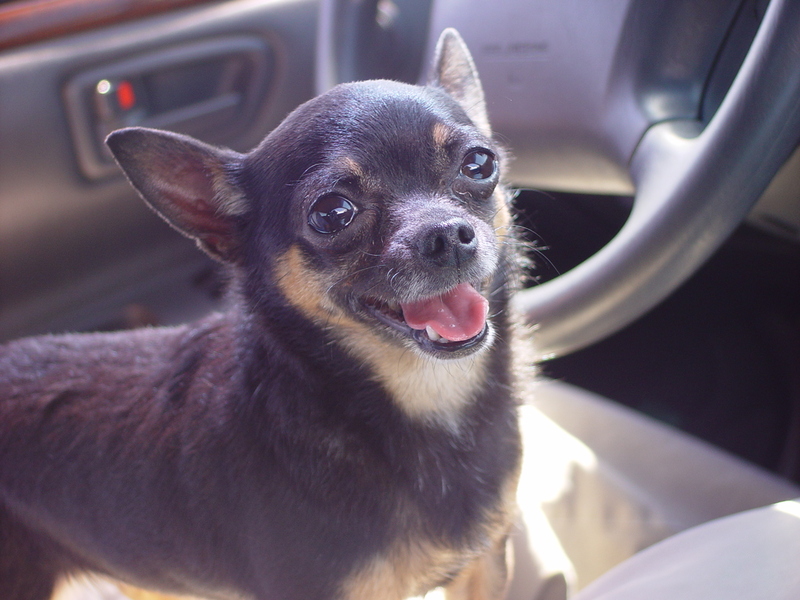 You ask, “How is it possible that a small dog could bring so much joy to one person?” I never owned a Chihuahua before Mattie, but I remember that my grandmother owned a Chihuahua she called Panchito. Wherever my grandmother went, Panchito was with her; they were an inseparable pair. The bond between my grandmother and her beloved Panchito is what inspired me to volunteer to foster a Chihuahua. And now that Mattie is part of my life, I realize how much these small creatures can bring immeasurable joy. Fourteen years ago, Lucy came into my life with her innocent charm. Now my tiniest but greatest friend has earned her wings. Thank you Lucy, for taking me on this journey and for teaching me how to take pleasure in life’s little miracles that I might otherwise have missed. 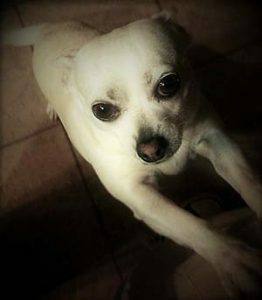 Thank you for making me laugh while you spent hours looking for a hiding place for your bone, or racing around the house after your bath to get the ‘clean’ off of you, or fetching your tiny ball and never bringing it back, or pushing off whatever was in my lap so that you could replace it. Thank you for being so patient while my grandchildren dressed you in silly outfits and made you participate in their homemade movies. 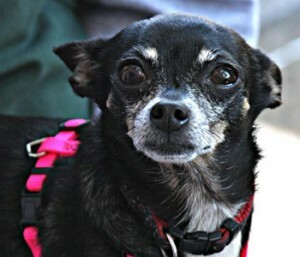 You may not remember us, but likely you’ll remember Ava (formally known as Chica). It is with broken hearts that we write you this letter. On January 31 our little girl took her last breath. We wanted to write you this letter as a way for us to begin to grieve, thank you for connecting us with her, and memorialize her beautiful life. We developed a special bond with her that was unlike any other. We considered her our first-born. Ava brought us so much daily joy, and we cherished every single moment we had with her. Ava was not simply a pet to us; she was an integrated member of our family. Look at any holiday family photo, and there she’ll be cradled in our arms. Ava slept with us (on our pillows) every single night. She ate with us. She went shopping with us (she loved car rides, her ears would perk up and she would run to the door when we said, “Ava, wanna go for a car ride?”). Literally hundreds of times people would come up to us and say, “she is beautiful, what kind of dog is she.” Children would always want to pet her, and she was always so accommodating. She sat with us when we watched TV (her spot with on the back of the couch, on her blanket), until she wanted some attention, then she would put her front paws on our heads and we would say “Ava dog a hat?” and play time would commence. She loved going on walks, or rather the word “walk” but preferred to be carried. Ava was also a brilliant little trickster and hider, and she learned that she could trick mom and dad into extra treats by “pretending” to go potty. She loved to find new places to hide and we would play a game called “find the Ava dog” where one of us would see her hiding and the other would try to find her. As hard as she played, she slept equally well and nothing was as cute as how she stretched; I only hope we have it recorded. Every parent always comments on how smart their child is and if it were true we’d have a world full of geniuses. In our eyes, Ava was the smartest. She would always let us know when she needed to go outside by sitting quietly by the front doors. If one of us didn’t see her, after a while she began to scratch at the door until we noticed and took her out. If it was at night and she needed to go out, she would politely scratch our chins until we woke up to take her out. We always knew when her dinnertime was because all of a sudden there she would be half jumping, with only her front paws, telling us she’s ready for dinner. The only thing more impressive than her intellect was the deep connection we developed. I remember you telling us, when we met her, that she had a hard life prior to her rescue, and we remembered that every day in how we cared for her. We tried to give her the best possible life we could; she was our princess, and she knew it! Both of our parents made comments that she had us wrapped around her finger, and that’s just the way we liked it! Ava traveled all over the country with use from San Diego, to Phoenix, and to Toledo, where she lived her final days. The moment we found out we had lost her, a part of us was lost forever and the emptiness inside is unlike any pain experienced before. 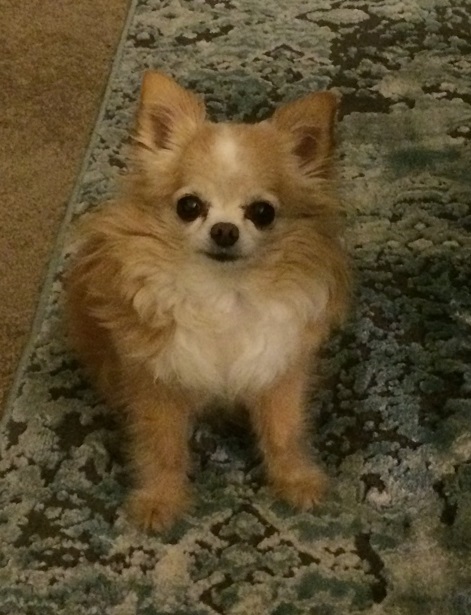 She is missed every moment and both my wife and I have noted that we had never felt an emotional connection to an animal the way we did with her. Again, she was our first-born. Some people may feel as though pets are just animals, and that’s fine. But to us, the love we have for her is the same as the love we have for our son. We don’t know how to process her loss; hopefully this helps because the pain is excruciating. Last night we found ourselves just driving around town, because we didn’t want to go home to an empty house. We tried sleeping with her blanket; of course it didn’t help and instead we held each other and simply cried together. They say time heals all wounds, and by God we hope that’s true. Ava was a constant bright spot in our lives, and she was always happy to see us and us her. We will continue to miss her every single day. We can’t thank you enough for allowing her to rescue us! We love love love our precious little girl, Ava.